It’s a test that far too many fail. Given its mind-numbingly simple criteria, one has to assume that people just simply aren’t even trying to pass at this point. No, this isn’t some discussion of standardized testing or the Common Core. We’re talking about the Bechdel Test. Named for the genius cartoonist (no really—she won a MacArthur Foundation “genius grant” in 2014) Alison Bechdel, her eponymous test is a simple way of assessing gender inequality in film and other forms of media. The only criteria needed to pass? There must be two or more female characters. These female characters must talk to each other. They must talk about something other than a man. …that’s it! Literally it’s as simple as “two girls walk into a bar and don’t immediately starting gushing about how dreamy some superhero dude is.” It seems like a no-brainer, but even today—a whopping thirty years after the concept was introduced in Bechdel’s comic strip “Dykes to Watch Out For”—a staggering number of films fail to reach this low, low bar. While the “Bechdel Test” has become an iconic entryway into discussions of gender representation in the media, it’s not the only reason we love Alison Bechdel. Her stunning graphic memoir Fun Home paints a nuanced portrait of her childhood and young adulthood, as Bechdel comes to terms with her own sexuality and learns some surprising details about her father’s sexuality along the way. It is raw. It is poetic. It is feminist. It is intellectual. And it is now…a Broadway musical? Not what you’d initially expect, but, yes, Fun Home is competing for twelve Tony Awards this Sunday night. 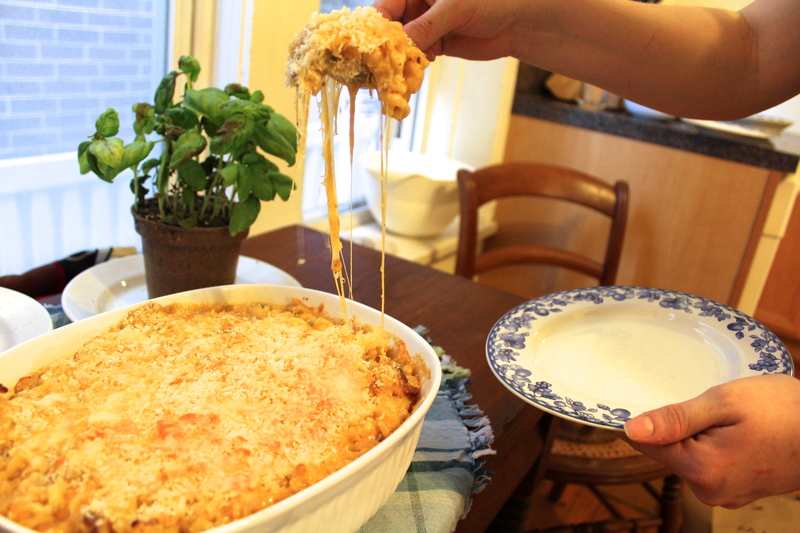 And what better way to celebrate the merging of two of our favorite things—Alison Bechdel’s unflinching feminism and musical theatre—than with a summery take on mac & cheese? 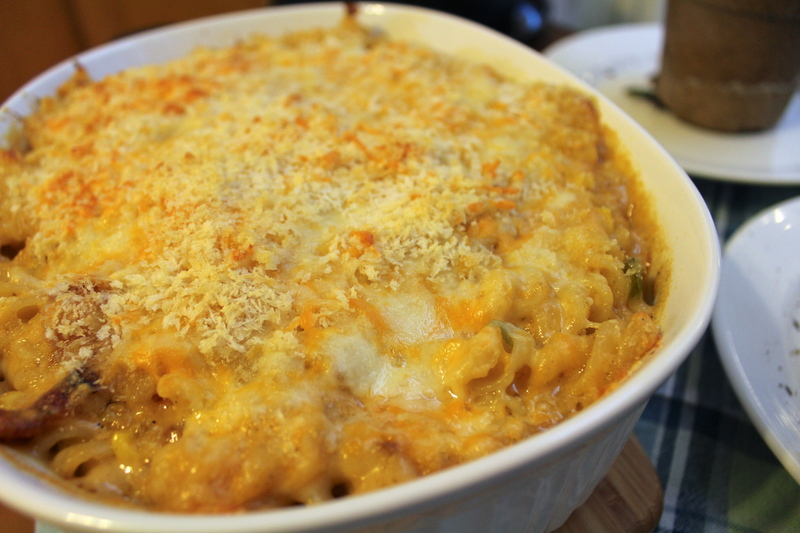 While we normally save the starchy, fatty goodness of mac & cheese for deep in the heart of winter, sometimes we just need some comfort food on a warm June night. This variation gets a smoky kick from a béchamel sauce spiked with cayenne pepper and smoked paprika. Bacon, jalapeños, and that most perfect of summery vegetables, sweet corn, bring this bad boy home. The race for the “Best Musical” Tony might be tight, but one thing’s for certain: we’re going to be stuffing our faces with this all weekend long. 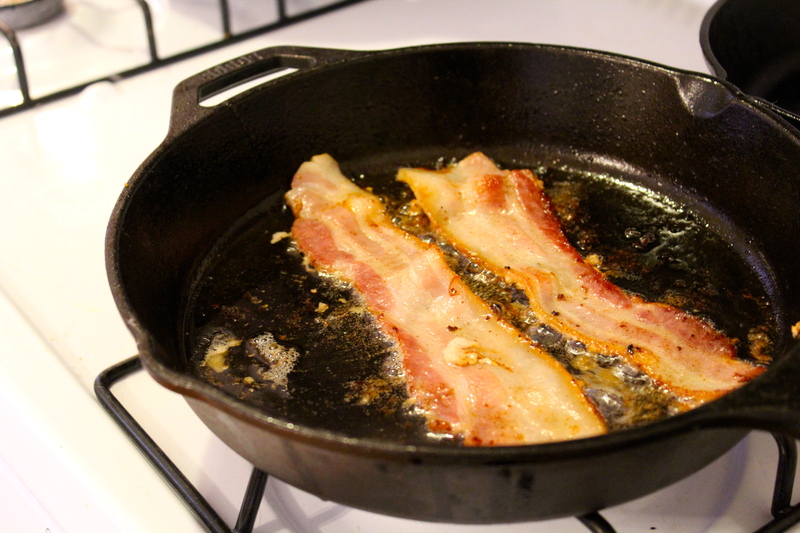 In a large skillet, cook the bacon until browned but not quite crispy. Remove from the skillet and drain on a paper towel-lined plate. Leave about 2 T of the rendered bacon grease in the skillet, and reserve 1 T for later. 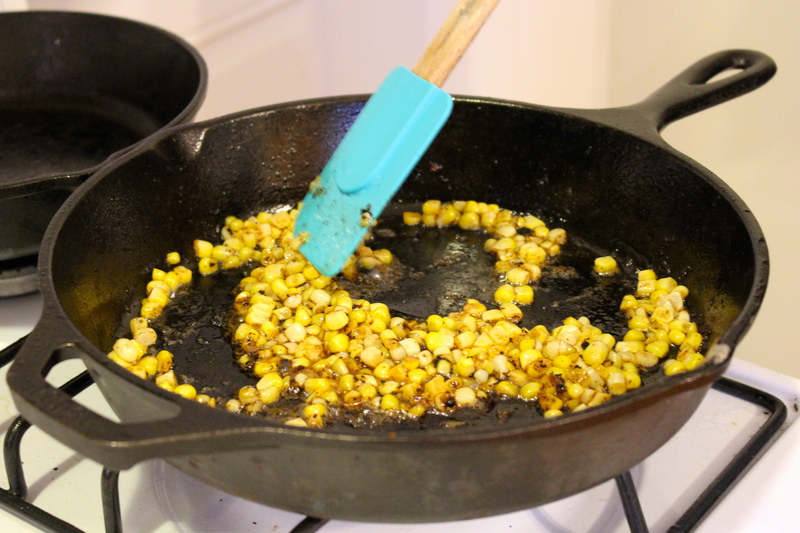 Cut the kernels off the ear of corn and place in the hot skillet. 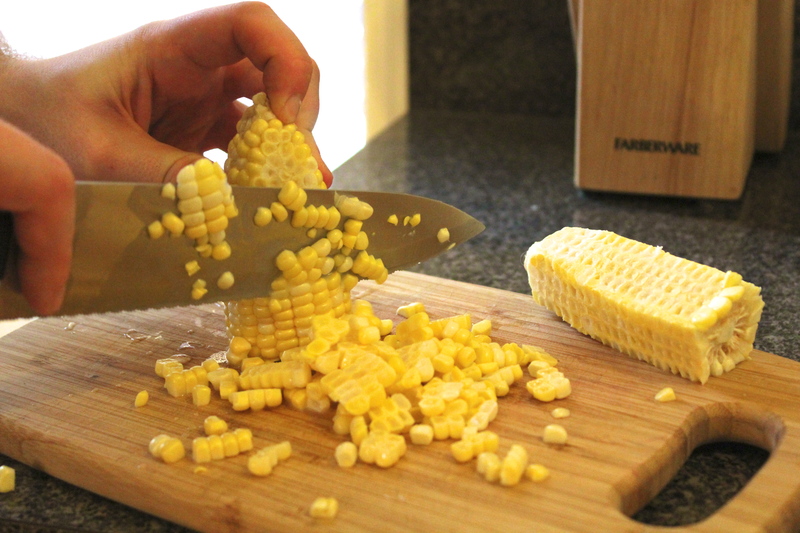 Cook, stirring every few minutes, until the corn begins to blacken around the edges. Remove from the skillet and drain on a paper towel-lined plate. Wrap the whole jalapeños in aluminum foil and place in the preheated oven for about 10 minutes, or until blistered and blackened. Once cooled, remove seeds and dice. 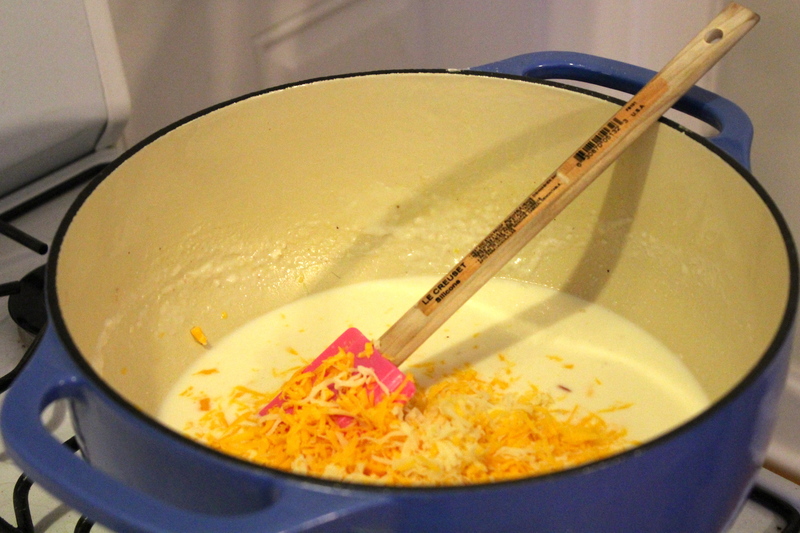 Grate cheeses, mixing them together in a large bowl. (If the cheese is too soft to grate, especially the fontina, throw it in the freezer for about five minutes to firm up.) Boil water and prepare the pasta according to directions, cooking about 3 minutes less than the called-for time. Heat a large Dutch oven over medium heat. Add in the 1 T of reserved grease and the butter, then add shallots and a pinch of salt. Cook 2-3 minutes, until soft and translucent . Add the garlic and cook about 1 minute longer. Add pasta to the sauce and toss until coated. 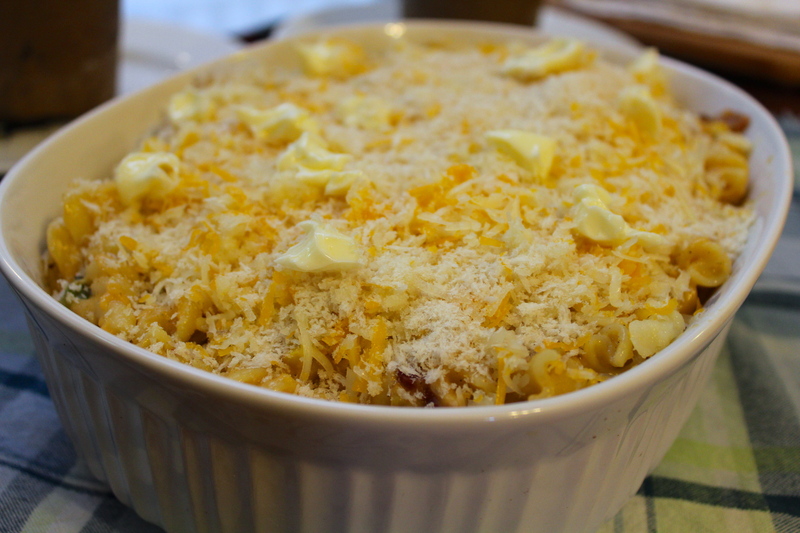 Sprinkle the top with remaining cheese and breadcrumbs (and, if you want a really crusty, bubbly top, some little bits of butter). Bake for 30-35 minutes until bubbly, golden brown, and utterly irresistible. It’s crazy. I wrote a blog post like about that test my blog. Avatar failed this test. Also the whole Lord of the Rings. We need more strong female characters in film. The mac and cheese looks AMAZING I mean AMAZING like sooo good!! Ugh RIGHT?! It’s truly shocking how many films fail to acknowledge women as human beings, year in and year out. At least we have mac & cheese to binge eat when the patriarchy is just too much to handle. The Bakeriarchy sprang into being when a book club of twenty-something arts administrators realized they spent more time talking about baking and feminism than about books. Delicious treats (and puns) ensued.